How can environmental degradation be stopped? How can it be reversed? And how can the damage already done be repaired? The authors of this volume argue that a two-pronged approach is needed: reducing demand for ecosystem goods and services and better management of them, coupled with an increase in supply through environmental restoration. Restoring Natural Capital brings together economists and ecologists, theoreticians, practitioners, policy makers, and scientists from the developed and developing worlds to consider the costs and benefits of repairing ecosystem goods and services in natural and socioecological systems. 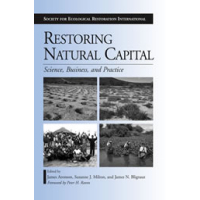 It examines the business and practice of restoring natural capital, and seeks to establish common ground between economists and ecologists with respect to the restoration of degraded ecosystems and landscapes and the still broader task of restoring natural capital. The book focuses on developing strategies that can achieve the best outcomes in the shortest amount of time as it: • considers conceptual and theoretical issues from both an economic and ecological perspective • examines specific strategies to foster the restoration of natural capital and offers a synthesis and a vision of the way forward Nineteen case studies from around the world illustrate challenges and achievements in setting targets, refining approaches to finding and implementing restoration projects, and using restoration of natural capital as an economic opportunity. Throughout, contributors make the case that the restoration of natural capital requires close collaboration among scientists from across disciplines as well as local people, and when successfully executed represents a practical, realistic, and essential tool for achieving lasting sustainable development.